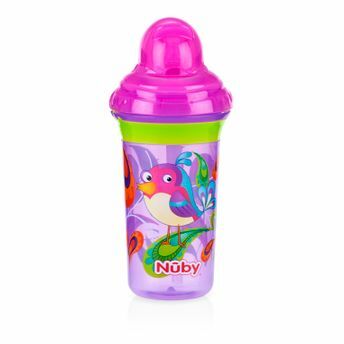 Nuby's new clik-it range of cups offers leak proof technology that you can see and hear so you won't have to worry about spills and leaks. Nuby's no-spill soft silicone spout is easy to use, easy to clean and assemble and allows your child's palate and teeth to develop naturally. This cup also features an innovative, ergonomic shape with easy-grips on the cup that ensures a comfortable, secure grasp. This revolutionary design is made for the parent on the go and is great for day picnics, hikes, and your child's recreational activities. Plus, it's bpa free. Additional Information: Distributed in over 155 countries, Nuby brand covers feeding, weaning, soothing, play, bath and nursery and boasts patented innovation in all of its categories. Since 1970, Nuby brand with its high quality products, strives to make the lives of parents and children easy so they can enjoy the most wonderful experiences of growing up, together. Explore the entire range of Feeding and Nursing available on Nykaa. Shop more Nuby products here.You can browse through the complete world of Nuby Feeding and Nursing .